Ready to explore lost tombs, trek across vast wilderness, and delve into the deepest dungeons. Adventurers. Brave, bold, and willing to take risks. 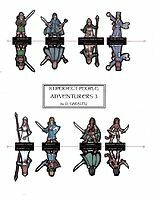 This set of eight adventurers includes a Warrior, a Fighter, a Ranger, a Female Warrior, a Dwarf, an Elfess Thief, a Sorceress, and a Cleric. 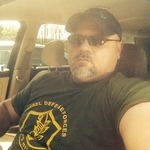 Ready to take on any mission. Yes, another set of brave adventurers ready to go out and explore in any fantasy world. 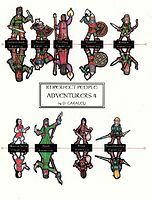 This set of eight hardy adventurers includes a Luna Priestess, a Barbarian Warrior, a Female Warrior, a Sorcerer, a Dwarven Thief, and Elf Fighter, a Cleric of the Sun, and an Elven Scholar. Let the games begin. This set of eight adventurers will include a Warrior with a 2-handed sword, a Bard, a Dwarven Priestess, a Sorcerer, a Female Cleric, a young Knight, a Tiefling Warrior/Rouge, and a Female Tiefling Rouge. Ready to explore the darkest woods or haunted forest... ADVENTURERS 4. These nine adventurers include a female Goliath Bard, a Dwarven Fighter, a Tiefling Warlock, a human Fighter with Axe, a female Ranger, a Martial Artist Monk, a Druid, a Rouge, and an Elven Swashbuckler. An odd collection of brave and bold men and women looking for fame and fortune. ADVENTURERS 5. 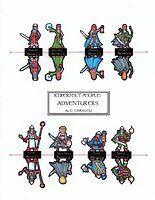 This set of eight Adventurers includes a human Bard with a Harp, a male Swashbuckler and a female Swashbuckler, a Martial Artist Monk with a Stave, a human Barbarian with a two-handed Great Axe, an Amazon Warrior, a Goliath Barbarian with two-handed Hammer, and a Tiefling Sorceress. once again thank you.these figures will be very useful to me.As always they are very expressive and well done. Good to see some heroes in the mix. There aren't enough different classes available in the paper mini world in my opinion. I'll probably do a few more sets like this over time. Currently I'm working on a set of Tavern Patrons (including a few musicians) who can enjoy the services of your bar staff. These are really nice sets. ;D It's hard to find good NPC stock, especially without spending way too much money. May I ask if you intend on doing some teams of horses or mules to pull the wagons? Those would be really useful, I think. Check out Xtea's horses, she has a great draft horse that works wonderfully with the wagons. I saw those a little while after I posted. They definitely look nice, all right. Keep up the good work yourself. 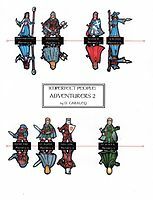 This set of eight hardy adventurers includes a Luna Priestess, a Barbarian Warrior, a Female Warrior, a Sorcerer, a Dwarven Thief, and Elf Fighter, a Cleric of the Sun (for White Knight), and an Elven Scholar (Tabris should recognize him). Let the games begin. I've also posted this at the top of the page to make it easier to find. As always, use Adventurers responsibly (don't just send them to their deaths). And i can't really see a goddess called Luna without remember my dear Scarlet Lady, Patron Goddess my favorite char ever. We are not using that setting in our games anymore but i think i'll mod that one just for the sake of the good old times. well I am very happy and so is my son.thank you for the excellent set. Just so you know, it has been so long since I played D&D (1st edition with the little, tiny books, 2nd edition, and a little 3rd edition) that I didn't even know what a Tiefling was (had to Google it). Not to mention Dragon Born (the rules only had Humans, Dwarves, Elves, Half-Elves, Half-Orcs, and Halflings back in the day). The idea of creating Tiefling pieces is of interest, but I doubt I will be able to do justice to Dragon Born (not a good dragon artist myself). Just out of curiosity. What do you play Dryw? I definitely think these heroes will be useful. I already know they're well-received. Makes a guy wish he could draw - but happy that others can. If you're looking for a challenge, try a female Golaith bard, playing a flute. I'm currently running the campaign so I don't really get to play. It is a fantasy world of my own creation using the Savage World rules. I have an NPC helping out at times, an Elven member of the Bardic College. Oaky, I'll bite, what's a Goliath? Lord knows I know what a bard is (I usually run Bardic characters and in real life I personally play Celtic harp, mandolin, guitar, banjo...), but I suppose I'll have to Google what a Goliath looks like. Okay, just got back from Google. A seven and a half foot tall, stone-skinned, mountain race. Almost like an Obsidiman from EarthDawn. I get it. Nice to know you are also on Savage Worlds. Which my players would accept running fantasy on it. I hate to keep the off topic line but I'm still pluging along with 1st edition AD&D,I never could stomach the later editions.I guess there were just to many 12 year old "power gamers" who would juice the rules so that by 2nd level the gods were in fear of them me and my family and a few friends play just about every saturday night when I don't have football games to play.As Dungeon master I have even been giving the players charecters Christmas gifts lol. Thank you very much Dryw for the contuing stream of paper minis for our games. Your minis are great. ATM I play Savage Worlds too (and sometimes a simple retro version of DnD1) so how about some Solomon Kane style minis? (16th or 17th cent. fashion) Just if you need ideas. Another idea could be a fighter with a twohand sword or axe/maul. No problem. Those were just some ideas. The traditional canon fantasy races you're producing are fantastic. I actually favor the 2nd edition Forgotten Realms Tieflings, who were not significantly different from other humanoids in their appearance. Rather, they differed in terms of their demonic heritage and its effects; although they were never developed--as far as I'm aware-- into a PC race in 2e. I think they were available in the Planescape books as PCs, but not in Forgotten Realms. This set of eight adventurers will include a Warrior with a 2-handed sword, a Bard, a Dwarven Priestess (for Afet), a Sorcerer, a Female Cleric, a young Knight, a Tiefling Warrior/Rouge, and a Female Tiefling Rouge (the Tieflings were an experiment). The set is laid out and is waiting for my wife to wave her magic wand and turn it into a PDF. Hopefully it will post before the end of the day. 'Cause Monks are in the Imperfect Monks set, unless you mean Dwarven Monks. Maybe next set? You are the best, Dryw. I can't wait to see these. Check out the Imperfect Orient set for now, there are a couple of Martial Artist Monks in there. 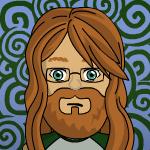 Maybe I'll throw additional ones in the next set of Adventurers. Enjoy as always. It is also posted at the top of this Thread. LOL at the Sorcerer gesture!!! Nice! Loved the warrior pose and his sword. And i'll sure use those tieflings as villains in my game.